Oliver Cromwell was born at Huntingdon, into the ranks of the English gentry on 25th April, 1599, during the latter years of the reign of Queen Elizabeth I, he was the son of Robert and Elizabeth Cromwell (nee Steward). Oliver was distantly related to Thomas Cromwell, Henry VIII's minister, his father being descended from Thomas' sister, Katherine Cromwell. Katherine married a Welshman, Morgan ap Williams. Their son Richard, adopted his mother's English surname. Surprisingly he was the seventh generation descendant of the French royal House of Valois, Cromwell's great grandfather, Morgan ap William (born Llanishen, Glamorganshire, Wales, in 1479), who married Catherine Cromwell, was the grandson of Jasper Tudor through the latter's illegitimate daughter, Joan Tudor. Jasper Tudor himself was the son of Catherine of Valois, daughter of King Charles VI of France and widow of Henry V, through her liaison with Owen Tudor, her Welsh clerk of the wardrobe. This made Cromwell and Charles I very distant cousins. His early years were uneventful, he attended Huntingdon Grammar School, and went on to complete his education at Sidney Sussex College, Cambridge. At the age of 21, Oliver married Elizabeth Bourchier, the daughter of Sir James Bourchier a London merchant, on 22 August 1620. Oliver and Elizabeth were to produce a large family of nine children, the eldest of these, Robert, was born in October 1621, 14 months after the marriage, he was followed by Oliver (b.1623), who died during the Civil War, then came a daughter, Bridget, in 1624, followed by another son, Richard (b.1626), who was to be eventually appointed his father's successor, then Henry in 1628, Elizabeth in 1629, James who died in infancy was born in 1632 , Mary in 1637 and finally Frances in 1638. A man of strong religious views, there is evidence to suggest that he suffered from a severe form of depression in the late 1620s and early 1630s.From 1628-1629 Cromwell served as the Member of Parliament for Huntingdon. At this parliament King Charles I was presented with a petition of rights, a major dispute over the matter was prevented by the assassination of the Duke of Buckingham. Disagreement with Parliament resumed when the speaker refused to put forward three resolutions hostile to the King and was forcibly held in his seat while a vote was passed. Charles threatened to send in troops and dissolved Parliament for the next eleven years. Faced with shortage of funds due to his involvement in the Bishops' Wars, Charles was to call a Parliament again in 1640, It sat for but three weeks. Later the same year a further parliament was called, which came to be referred to as the 'Long Parliament', Cromwell attended as the member for Cambridge. The M.P. John Pym listed the King's transgressions in his 'Grand Remonstrance' of 1641. The indecisive Charles I, urged on by his enraged and willful wife, Henrietta Maria of France, impeached Pym and four other members of parliament for high treason. In January 1642 he went to the House of Commons with armed troops to arrest the miscreants, but to quote Charles, "all the birds had flown" on his arrival. Failure to resolve these issues led to the outbreak of Civil War between the Crown and Parliament. Standards were raised for the first encounter of the Civil War in on 23rd October, 1642, when the indecisive Battle of Edgehill was fought, in which Cromwell, who had no formal training in military tactics, led a troop of cavalry. By 1644, he had risen to the rank of Lieutenant General of Horse, playing a prominent role in the Parliamentary victory at Marston Moor on 2nd July 1644 . The highly trained New Model Army was formed in 1645, commanded by Sir Thomas Fairfax, with Cromwell occupying the position of second in command and a decisive victory was won at Naseby in June 1645. The king fled the field and the battle effectively ended Royalist hopes of victory in the Civil War. Cromwell, Fairfax and Henry Ireton presented Charles with the Heads of Proposals by which he might remain King but with a written constitution. Charles was obstinate and procrastinating and negotiations broke down. In retaliation the New Model Army then marched on London and took the capital. The King resorted to attempting to use the Scots against the Parliamentarians. The army was now demanding that "Charles Stuart, that man of blood" should be brought to account for his crimes against the people and the King of England was put on trial for his life. Cromwell was amongst those M.P. 's who strongly believed that the execution of the king was the only way to end the prolonged bloodshed of the Civil War. Charles death warrant was signed by 59 Members of Parliament, including Cromwell, whose signature occupied the third place on the document, the king was accordingly beheaded at Whitehall on 30 January, 1649. England was declared a republic, ruled by what was known as the Rump Parliament. Cromwell led a campaign into Ireland from 1649 to 1650 to put down a Royalist uprising, where his ferocious retribution and the massacres of Drogheda and Wexford earned him a reputation for cruelty. In May, 1650 he led a Parliamentary army into Scotland, where the Scots Covenanters had risen in revolt, proclaiming Charles I's eldest son as King Charles II. He defeated the Scots at Dunbar and proceeded to take Edinburgh. The future Charles II marched into England to confront Cromwell at the head of a Scottish army, but suffered defeat at the Battle of Worcester in September, 1651. Being forced to flee, Charles then spent six desparate weeks as a fugitive in hiding before escaping to the safety of France. Frustrated at the continual bickering of the various parties in the government, Cromwell dissolved the Rump Parliament, ordering the house cleared at the point of a sword. Following the failure of his Puritan convention, known as Barebones Parliament, he appointed himself Lord Protector of the Commonwealth. He was offered England's crown in 1657 but refused to accept it. As Lord Protector, Cromwell formed an alliance with France against Spain. An attempt to wrest Hispaniola from Spain failed, but he did succeed in taking Jamaica; and an English expeditionary army won a great victory over the Spanish in the Battle of the Dunes (1658) His government divided England into 11 districts, each of which was ruled by a major general. They were responsible for tax collection, justice, and also fulfilled the role of guardians of public morality. Under his strict Puritan rule, church attendance became compulsory, while such entertainments as horse racing, cockfighting and attendance at plays were forbidden. 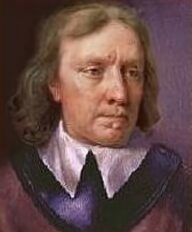 During a bout of the recurring malarial fever he had suffered from for some time, believed to have been contracted during his Irish campaign, Oliver Cromwell died at Whitehall on 3rd September 1658. A violent storm raged on the night of his death, which was said by his enemies to be the devil bearing away his soul. He was interred in Westminster Abbey . He nominated his eldest son, Richard, to succeed him as Lord Protector, however, Richard Cromwell was not the strong personality his father had been and had no aptitude for government. General Monck laid proposals before Parliament for the restoration of the monarchy, causing Charles II to be invited to return by Parliament in 1660. On 30th January, 1661, the twelfth anniversary of the execution of Charles I, the body of Oliver Cromwell was exhumed from Westminster and posthumously executed. His corpse was hanged in chains at Tyburn. The body was eventually thrown into a pit, while Cromwell's severed head was exhibited on a pole outside Westminster Abbey until 1685. The head was buried in the twentieth century in the grounds of Sidney Sussex College, Cambridge.